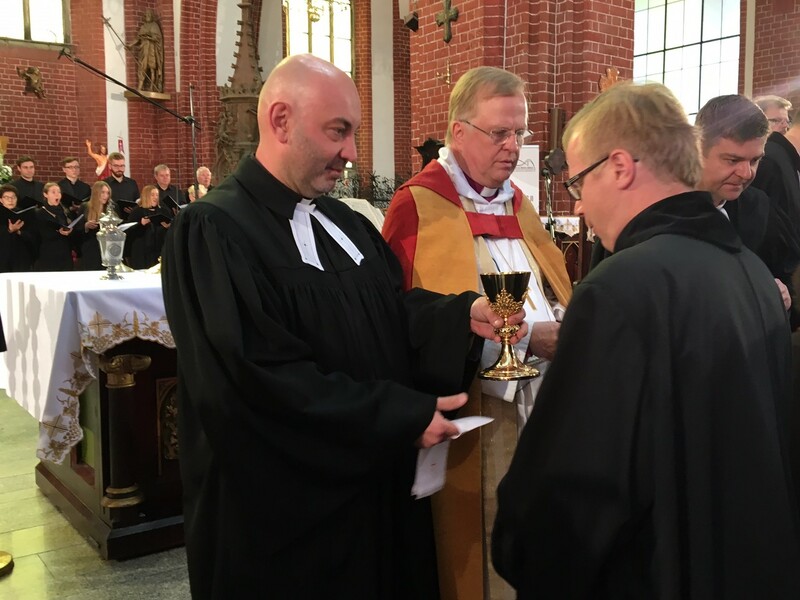 Under helgen har reformationsjubiléet uppmärksammats i en av två polska reformationsstäder, nämligen Wroclaw. Hit kom reformationen med full kraft på 1520-talet genom Johannes Hess. 80 % av befolkningen var evangelisk-luthersk vid tiden för Andra världskriget. När staden tömdes på tyskar och polacker flyttades hit återstod bara en spillra av reformationskyrkorna. Numera är det en öppen och expansiv stad med goda internationella kontakter över nationella, konfessionella och religiösa gränser. I en stad med cirka 700000 invånare kommer över 100000 från Ukraina. Ett brett sammansatt program visade reformationens betydelse och aktualitet liksom de goda ekumeniska kontakterna och en stad som bygger broar mellan människor. Vid den avslutande nattvardsgudstjänsten i Maria Magdalena kyrka – ursprungligen en luthersk kyrka, nu en gammalkatolsk – manifesterades en inkluderande gemenskap. Den romersk-katolske ärkebiskopen avslutade med ett ekumeniskt präglat tal i den TV-sända gudstjänsten. Jag höll följande predikan över Psaltaren 98:1-4. Drogie siostry, drodzy bracia! Dear sisters and brothers. 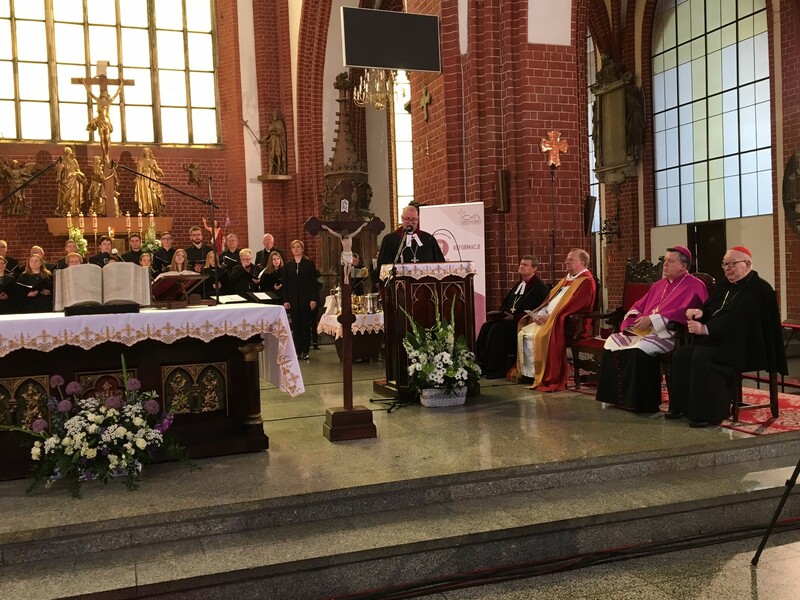 We are gathering here in Wroclaw commemorating 500 years of Reformation. It takes place on the Cantate Sunday between Easter and Pentecost. When we look back we can rejoice because of what the Lord has done in Christ for our salvation and liberation. When we look forward to Pentecost we can praise the Lord for renewing our lives with the gift of the Holy Spirit making it possible for us to receive what Jesus has said and done, and also to grow in faith and witness to our faith in daily life. Doing so we follow in the footsteps of the Reformers and all faithful Christian people throughout the Ages. The Cantate Sunday has got its name after the first word in Psalms 98, ”Sing a new song to the Lord, for he has done marvellous deeds; his right hand and his holy arm have won him victory.” The original word about the victory the Lord has won says literally that he was enabled to save his people. Yes, that is also why we have gathered. We have been summoned by the Lord. We are here to sing to the Lord, praising him for what he has done for our salvation in Jesus Christ. The Son of God became one of us but without sin. He shared our lives, suffered and died on the cross for the reconciliation of the world and our salvation. The cross of damnation became the cross of victory when he walked through the valley of death to eternal life. Christ has opened a new way for us – through death to life. He has risen and we shall rise. We are called to follow him during our life time, and then at last when our time on earth is over we follow him to eternal life. In baptism we were incorporated into Christ and his Church, receiving the spiritual power of the death and resurrection of Christ. We walk through death to life as he did. The baptismal pattern through death to life is the Christian pattern for daily life. We receive it as a gift in baptism. Every day we have the opportunity and calling to leave everything that is connected with death in our lives and instead receive through grace alone the new life from Christ. We do this by confessing our sins and receiving forgiveness, by coming before God in faith entrusting our lives to the blessing hands of the triune God, and over and over again receiving renewed life through the means of grace. So we have all the reason in the world to sing together to the Lord in gratitude for what God has done for us in Christ from Good Friday to Easter Day and that he continues to do so. God has done marvellous deeds for our salvation. God is almighty, holy and full of divine love. Therefore, God can liberate us from all evil and the burdens that rest on our shoulders. Jesus Christ has accomplished that for us. Our only possibility for a renewed life is to receive it by faith through grace. Your personal burdens, which are they? How does your struggle look like? Only you know. There are different things that bind us, and we can identify some as belonging to the power of death. Many people today struggle with demands of various kinds. In the gospel, we are invited to be renewed by the mighty acts of God. We meet grace, not demands. The message can only be received in faith. And when we practice faith in daily life, we can grow in faith by the power of the Holy Spirit. We are created in the image of God, therefore we have a programme for life, and that is to be more like God, to be what we already are as God’s beloved creation. There is no way that we can save ourselves. This is what Martin Luther experienced when he struggled with all the spiritual demands that were put on him. He really had great difficulties experiencing that God is the God of mercy. Luther was so occupied with all that he had to do in order to please God. The personal Reformation break-through happened when he was enlightened by the Good News of the New Testament. He knew them very well as a Biblical Scholar. But the outer word had to become his inner Word. Then Luther realized that he was totally dependent on Gods saving acts to be free before God, liberated at last. The Holy Spirit made it possible for him to receive the gospel. All human beings long for the source of life, its meaning and goal because we are created in the image of God. We are longing for real life in the presence of God. We are supposed to be co-workers of God in creation with all the abilities and skills that he has given us. But we are captured in evil structures and personal sin. We seek, but too often in wrong places. But still, we always seek and long. It is a question of life, our need for life. We cannot achieve it away from the presence of God, neither by our own deeds, thoughts and power. During the Centuries there are many of us who have realized this truth, because of the spiritual insights inherited from the Reformation. Today we share much of this with other traditions within the worldwide church. One example is the Joint Declaration on the Doctrine of Justification signed 1999 by the Lutheran World Federation and the Pontifical Council for Christian Unity in Rome. 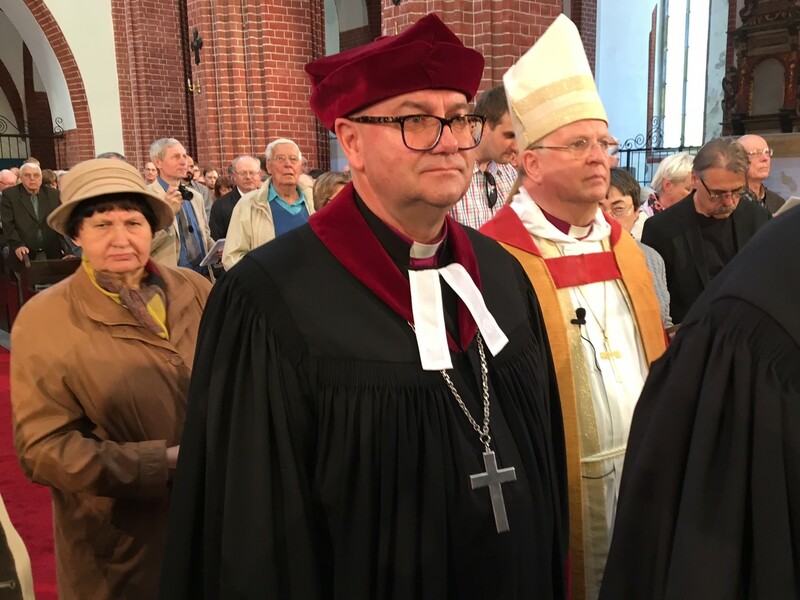 After five Decades of ecumenical dialogue it was possible, because earlier divisions in our fundamental proclamation of the Gospel have been overcome. This marks a new era in the relation between the two traditions that were drawn apart in the 16th Century. So let us sing a new song to the Lord. We sing it because of the grace that is at the centre of Christian faith. We sing it because many people have been saved and renewed due to the faithful preaching of the Word in the Reformation churches. We sing it because we have been drawn together with our fellow Christians of the Roman Catholic, Orthodox and the other churches of the Reformation by the mighty acts of the triune God in our times. We are longing for receiving the unity that is a gift of God. Our saviour Jesus Christ prays for us, that we may be one. In view of the wonders of grace and righteousness displayed in God’s salvation, the whole creation is invited to unite in praise, as it is said in verse 4 of psalms 98: “Acclaim the LORD, all the earth; break into songs of joy, sing psalms.” The union of mercy and truth secure the blessings of the promise to the world. We are the people of hope. Amen.